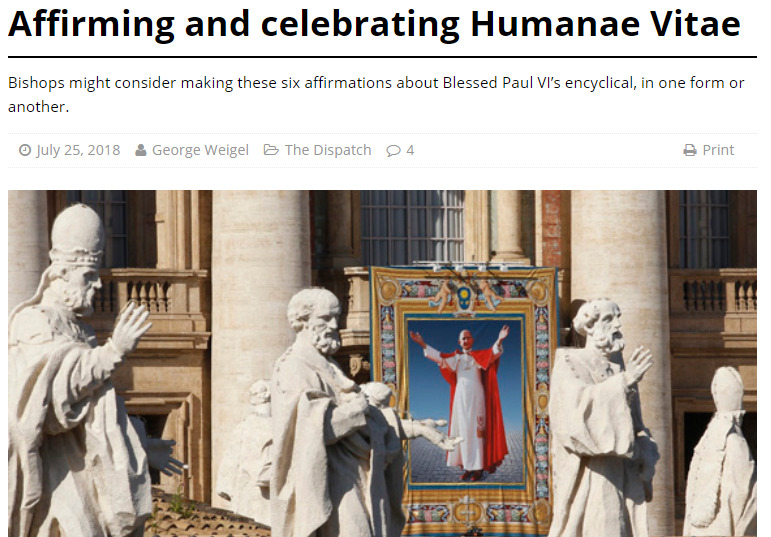 Bishops might consider making these six affirmations about Blessed Paul VI’s encyclical, in one form or another. I am deeply grateful to Pope Paul VI for his courageous witness to the truth about love in the encyclical Humanae Vitae. With Pope Francis, I believe that Paul VI “had the courage to stand against the majority, to defend moral discipline, to exercise a ‘brake’ on culture, [and] to oppose [both] present and future neo-Malthusianism,” which treats the gift of children as a societal and economic burden. I believe that the truths taught by Humanae Vitae on the appropriate means to plan a family are important for human well-being today; that conscious use of artificial means of regulating fertility distorts the truth about human love inscribed into Creation by the Creator; and that conscience must respect these intrinsic truths in family planning. I believe that the truths taught by Humanae Vitae about natural family planning have proven themselves in pastoral situations around the world; that those truths have made significant contributions to family ministry and marriage preparation in various cultures; and that those who deny the human capacity to understand and live the disciplines of natural family planning often engage in racism, new forms of colonialism, or both. I believe that the “contraceptive culture” of which Paul VI prophetically warned in Humanae Vitae, and the related abortion license, are major factors in the sexual abuse of women that has come to public attention through the #MeToo movement; and I invite feminists to rethink their celebration of artificial contraception and abortion on this 50th anniversary. I believe that St. John Paul II’s “Theology of the Body” has given the Catholic Church a compelling tool for explaining both the truths taught by Humanae Vitae and the unhappiness caused by the sexual revolution. I pledge to make this anniversary year an occasion to celebrate the gift of Humanae Vitae and to use my pastoral office to deepen understandings of the Catholic sexual ethic as a celebration of human dignity and the gift of life.